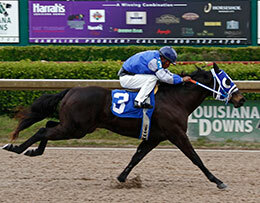 Ardor, under jockey Luis Vivanco, won the third trial for the Harrah's Entertainment Futurity by 3 � lengths. BOSSIER CITY, LA�MARCH 1, 2016�IVORY JAMES dominated nine trials on Tuesday for the Grade 3 $263,000 Harrah's Entertainment Futurity at Louisiana Downs by siring three of the 10 finalists, including second fastest Ardor. The 10 fastest two-year-olds, from the 82 head who participated in nine trials on Tuesday, will return to the Northwest Louisiana racetrack Wednesday, March 23 to vie for the $118,350 winner's purse in the first "Open" futurity for two-year-olds of 2016. Ardor, a colt by multiple stakes sire Ivory James, was impressive while posting a 3�-length win in the third trial under jockey Luis Vivanco. Conditioned by trainer Jorge Luis Barrera, the brown colt out of First Fervor by First Down Dash, stopped the clock in :15.399 seconds, a 93 speed index with a 15 mph tailwind, for the second fastest clocking. J F Racing and Farm, LLC purchased the $22,000 Heritage Place September Yearling Sale graduate from breeder Bobby D. Cox. Ardor is a half-brother to G1-placed The Printing Press and stakes-placed Imadancinwiththestarts. His dam is a First Down Dash sister to champion First To Flash and stakes winner First To Shine. Ardor was the first of three qualifiers bred by Bobby D. Cox. Half the field qualified from the sixth trial when Marfilous, an IVORY JAMES colt defeated Do It Again by half-a-length to get the fifth fastest time of :15.652 with a 15 mph tailwind. David Alvarez had the riding call. Also bred by Bobby Cox, Marfilous is owned-and-trained by Martin Trejo. The $9,500 TQHA Sale Graduate is the first foal for the unraced Ocean Runaway mare Verrsace. This is the family of Champion Brimmerton and former Broodmare of the Year Fitting Celebration. The aforementioned Do It Again held on for the sixth fastest time of :15.747. Kelly Bode bred the IVORY JAMES colt in Texas from the Vital Sign mare Diamonds For Toni. Javier Contreras trains Do It Again for owner Priscilla Rodriguez. Antonio Alberto was up. For the complete list of Harrah's Entertainment Futurity(G3) finalists, their times, sires, dams, owners, breeders, trainers and jockeys CLICK HERE.